So long as we were making our way north – first along the Namibian coast, and then through desert and scrubland – it was pretty easy to stay in the moment. But Etosha was the turning point, both literally and figuratively. There is no more green space further north until one crosses the border into Angola, so after three nights in Etosha, we turned back towards Windhoek, acutely aware that our Namibian travels were drawing to a close. The Kalahari Desert derives its name from an indigenous word that is variously translated as either “the great thirst” or “a waterless place.” Its arid name notwithstanding, the Kalahari is not considered a “true” desert in the same way that the Namib is. In fact, the Kalahari is home to quite a wide array of birds and animals, and its red sands support entire ecosystems of trees, grass, and shrubs. Seven years in the making, an ambitious amendment to the Montreal Protocol was adopted in Kigali in the wee hours of the morning last Saturday. Over 170 nations committed to phase out the use of a powerful heat-trapping chemical, which will cut one degree Fahrenheit from the projected increase in atmospheric temperature. With the whole Embassy working tirelessly to support our negotiating team, this diplomatic achievement feels incredibly gratifying – both because it is a big deal in the fight against climate change and also because it feels good to make a contribution, however small, to bend the arc of history in the right direction. Murchison Falls National Park straddles a sizable portion of the Victoria Nile as it winds its way through northwest Uganda before emptying out into Lake Albert. We were a tiny bit skeptical that safari in Uganda would live up to the game parks we had experienced in Kenya, but several of our Kampala-based friends spoke highly of Murchison, and rightly so – with 450 bird species and 76 different kinds of mammals, the park has quite a lot to offer. When we lived in Kenya, we frequently took our visitors to the David Sheldrick Elephant Orphanage. Baby elephants that become separated from their mothers because of an accident (falling down a well, for example) or who are orphaned as a result of poaching (a phenomenon that has sadly become all too common) stand little chance of surviving in the wild. The Sheldrick Trust rescues baby elephants from all over Kenya, cares for them in Nairobi, and then releases them into the Tsavo wilderness when they are old enough. A couple of years ago, one of our photographs nearly wound up hanging in Chicago’s Field Museum. Another photograph was included in a Polish publication aimed at educating children about various indigenous dwellings around the world. This year, another artist reached out to us to ask for permission to use one of our photographs for a project that represents the coolest use of our work to date. Our first road trip out West, we saw coyotes and foxes, in addition to various other more commonplace animals. Part of the joy of spending time outdoors, of course, is encountering animals in their natural habitats. Although no predators deigned to show themselves during our recent road trip through the American Southwest, the wildlife encounters we did have – some a little too close for comfort, even – left us feeling incredibly fortunate. 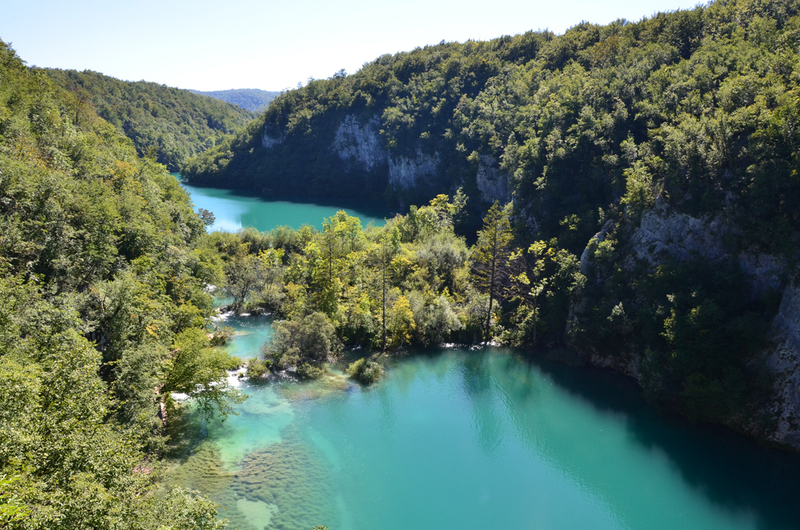 After two weeks on the coast, we headed inland to Plitvice National Park for our last bit of sightseeing in Croatia. The park, which extends over almost 300 square kilometers, encompasses sixteen lakes that form a vast natural staircase, cascading one into another in a myriad waterfalls. What’s more, algae in the lakes make their waters unbelievably limpid at the same time that minerals tint the surface various shades of blue and green.